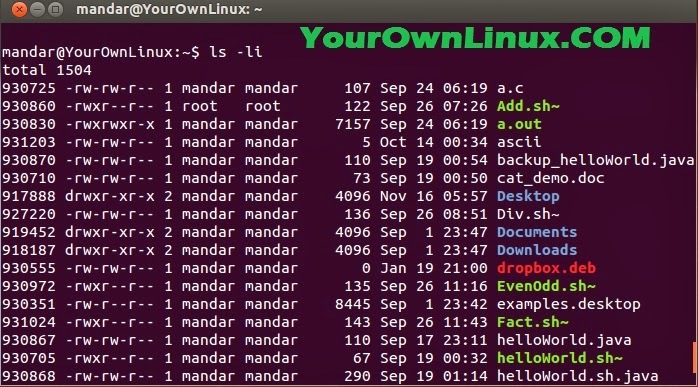 One of the most used commands by Linux users and the one that a Linux beginner must learn is- 'ls' Command. It is usually used to view the contents of current directory. 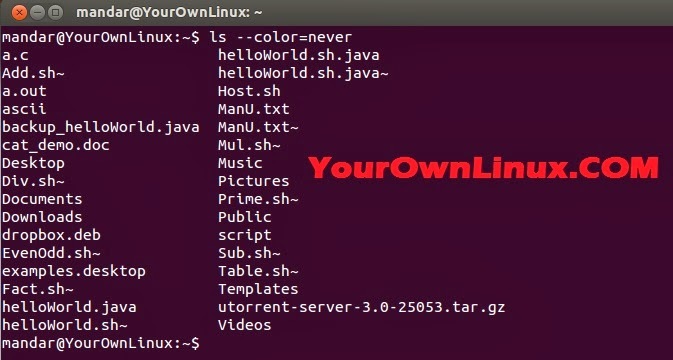 So, when you run this command, the files and sub-directories included under the current directory will be listed before you. 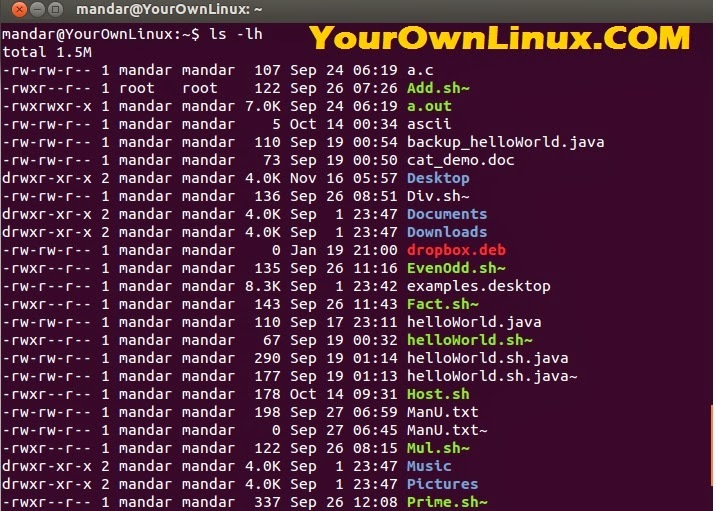 Very useful command and everyone who uses Linux should know this command. 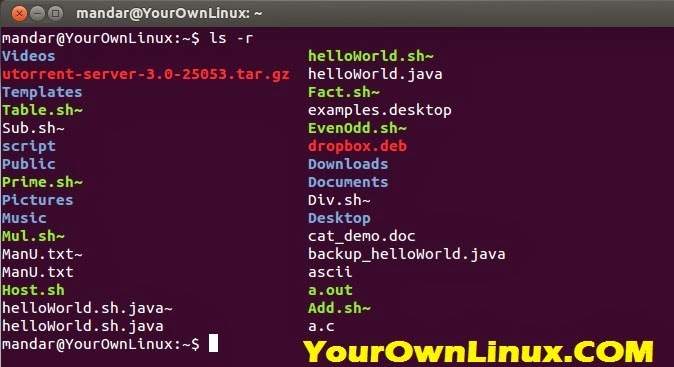 This tutorial will guide you to know more about 'ls' command with it's basic usages. Here we start ! The most basic use of any command is when it is used without any option or parameter. So, when ls command is executed with no option or parameter, then it will enlist files and sub-directories of current directory. 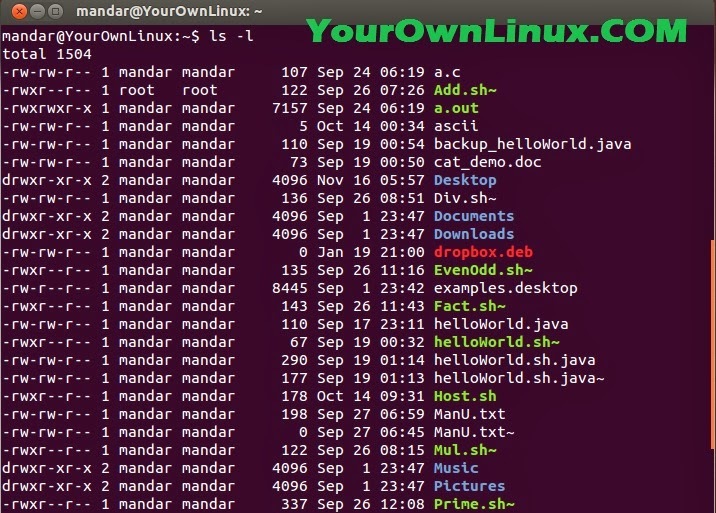 ls command when used with option -l (L in small caps), it will display the contents of the current directory in a long list format. and the last and 7th column is the actual file/directory name. 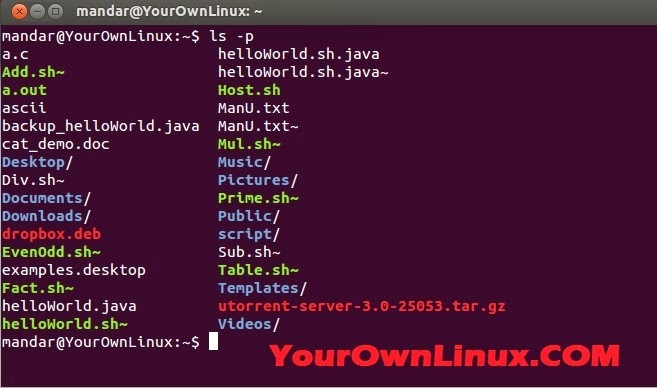 You can sort the ls command output such that largest file (according to size) will be displayed first and smallest one at the last and this can be done with the use of option -S.
In the above example, I have scaled the file size to KB and to do so, I have replaced the [SIZE] thing in the syntax with letter 'K'. 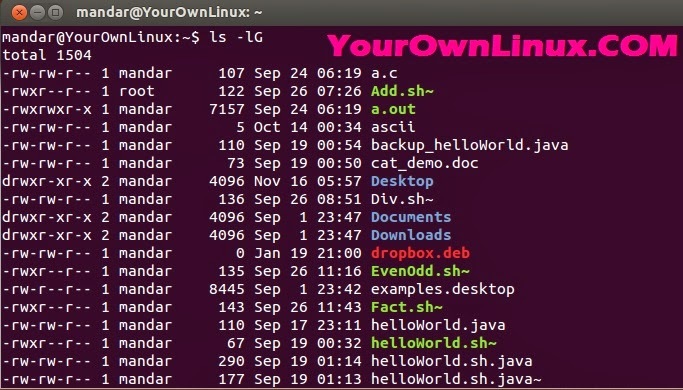 In Linux, the files can be hidden by starting a file name with a "." (dot) symbol. 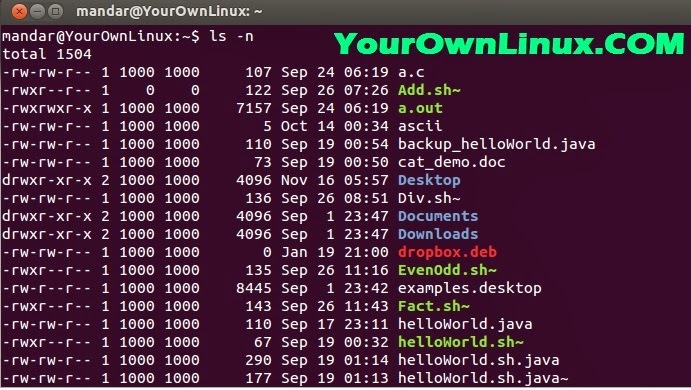 You can list these hidden files by the use of option -a with ls command. You can exclude the columns providing Owner and Group information by using options -g and -G respectively. When ls command is run with option -n, it will print UID and GID of the owner and group instead of their names. This will simply colorize and de-colorize the list when the [VALUE] in the syntax given below is replaced by proper values. You can de-colorize it by replacing [VALUE] by never and colorize it by replacing it with auto. This is to make identifications of the directories easier. This is for sorting the results in reverse order. ls command when used with option -R, it will display the contents of the sub-directories too. With the option -X, you can group the files with same extensions together. You can sort the output according to the time of modification. Recently modified file will be displayed first. That's all about ls command !! Thanks! this helped me a lot !!! Thanks for ur briefly explanation. Thanks lot. but what does "ls >> list" do compared to "ls > list"
Explain how and why these commands produce different results. A1. 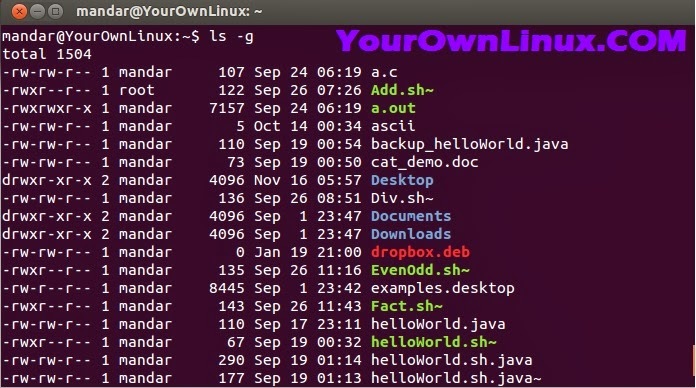 ls > list - directs the output to a file named "list" instead of to the terminal. The file is created if it does not exist. The file is overwritten if is already exists. A2. 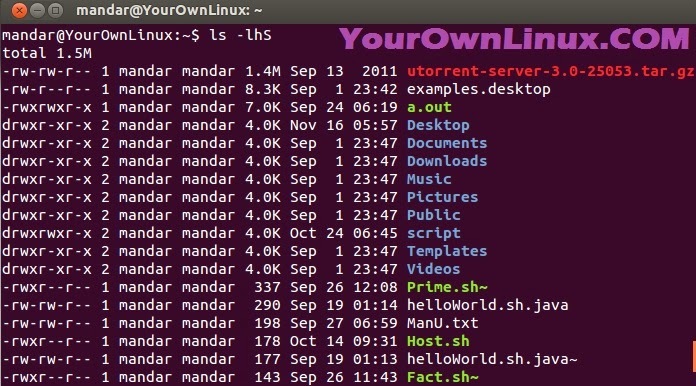 ls >> list directs the output to a file name "list" rather than to the terminal. The file is created if it does not exist, and it is appended to if it already exists. 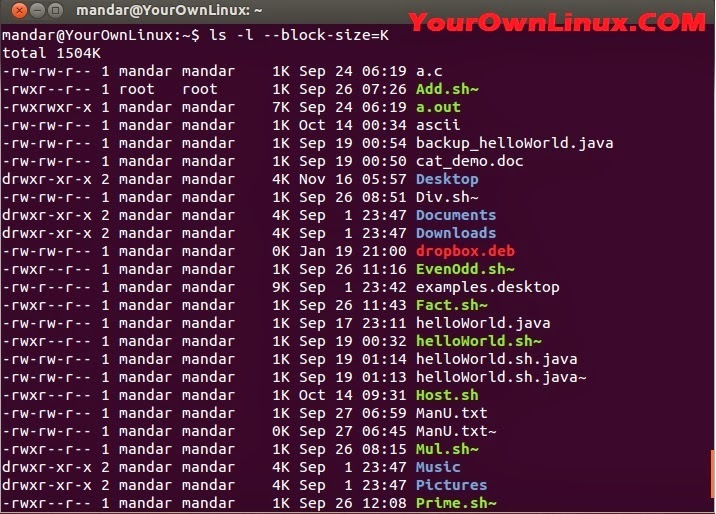 if the file does not exist then ls>list and ls>>list are the same. Mandar, Thank you for the useful and concise review !! Can you please tell what will 'ls -s -k' do? Thanks for the helpful blog! Lots of LS command examples you have shared here. 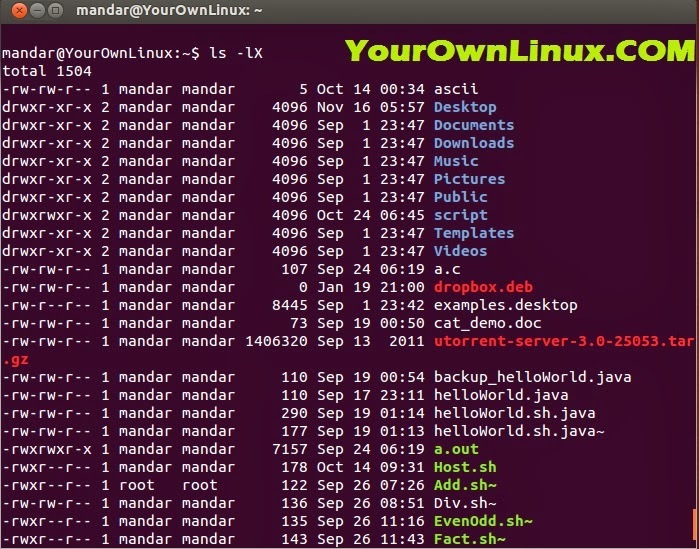 I would like to include few more examples like : show the size of file ($ ls -lh), print entries without owner information ($ ls -g), there are lot more examples, check 20 'LS' Command in Linux here.